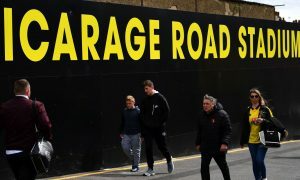 After a comprehensive thrashing of Dutch champions Feyenoord on Wednesday night, Manchester City return to Premier League action with a trip to Vicarage Road to face Watford on Saturday. The Blues are unbeaten in their last twelve fixtures under Pep Guardiola, but Watford are in a purple patch of their own, currently residing in fourth place in the Premier League table. Marco Silva’s side are likely to sit deep and try to hit the Blues on the counter, which leaves Pep Guardiola with a choice to make regarding the starting formation. While the former Barcelona manager has seemingly favoured using three-at-the-back, I expect him to use the same system he used against Feyenoord. With a tough midfield core consisting of Abdoulaye Doucouré and Nathaniel Chalobah stationed ahead of a stern defence, City will have to work hard to break Watford down. Leroy Sané impressed against Liverpool with a two-goal cameo, but may have to settle for a place on the bench as Watford are unlikely to leave much space in behind their defence. Raheem Sterling has made a very promising start to the season and returns from suspension after his controversial red card against Bournemouth. I expect him to take the place of Bernardo Silva, who played his first full 90 minutes for the Blues on Wednesday night. Sergio Aguero was taken off for a rest after 60 minutes at De Kuip and is expected to partner Gabriel Jesus up front for City. Danilo did very well in a central role at the Etihad last Saturday but may be consigned to a place on the bench after an impressive showing from City’s back four of Kyle Walker, John Stones, Nicolas Otamendí and Benjamin Mendy in Holland. Vincent Kompany remains on the sidelines. Fernandinho has started every game for the Blues this season and may be in need of a rest but it is unlikely that Ilkay Gundogan is ready to start yet, and so I expect the Brazilian to feature in a midfield three with the magnificent Kevin De Bruyne and David Silva.